Sleepy Kittens sounds like a great book. I saw the movie Inkheart before I read the book. I like the book more (It was so beautifully written that it took me 2 weeks to read it. Usually, I'm a fast reader. ), but by reading it after seeing the movie I don't have as many objections to the film. Thanks for offering the giveaway. I never did see Inkheart...hmmmm. Anyhoo, wanted to say hello since you stopped by about, oh, over a month ago!!!!! I took a little hiatus! My husband really enjoys watching movies like that one! I rarely read a book just because I saw on TV or in a movie....but I am open to reading anything so if it looked good I might read it. This would be a wonderful hit in my household! I'm following you now!!! I would love to win this for my daughter who loves to read. I think my kids would really enjoy these, especially after they see the movie. (Slightly off the subject, but about product placement...) My husband worked for Anheuser-Busch awhile back in one of their breweries. You would not believe the number of movies that have used the A-B LA brewery as a set (the new Star Trek movie, for example). Once you know what it looks like, it's crazy how often it shows up as different locations! I love that kids can connect with this book through the movie or vice versa. It's pretty good marketing if you ask me. Great giveaway! My kids really want to see this movie. Great prize pack! The kitten book is so cute and any kid would love the other books and prizes! Great giveaway! I haven't read anything because I've seen it read, but that doesn't mean I wouldn't. i saw this movie. it was cute and quite amusing. i love that the kitten book is real even if it's changed a bit. how adorable! it's great when movies and other things mention books. I love it! Awesome giveaway! Sometimes if a movie is really nice, I end up reading the book but most of the time, I have read the book or read the book first :) Thanks for the chance! We saw this movie and everyone in our family loved it! The prize pack looks wonderful and I'm so glad there's a sleepy kitten book! The kids are really looking forward to seeing this movie. Took the kids to see the movie today and they absolutely loved it! these books would continue the good times. 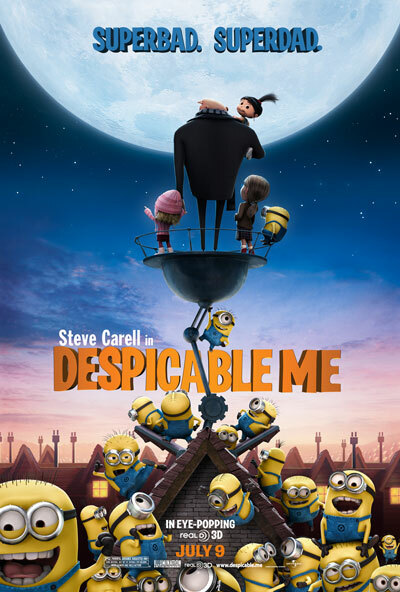 If you enjoyed the movie Despicable Me, you’ll probably enjoy this Mr. Media Radio interview with screenwriters Ken Daurio and Cinco Paul. They also wrote Horton Hears a Who! and are working on an adaptation of The Lorax. I would love to win this prize pack for my kids! They would love it! p.s. books don't always translate well to movies - so many people were disappointed with what was done to the first Percy Jackson book. Additional entry: I subscribe to your blog in my google reader. Great prize pack! The kids enjoyed the movie. We saw the movie this weekend, and I immediately wondered about the book (and the one that Gru writes to replace it). Will post and comment again! I went back and read all the Narnia books after the movies came out. I don't recall ever reading anything after seeing it in a movie, but ut does seem like a good way of advertising. I started reading the Sookie Stackhouse book series after seeing True Blood on HBO. (Don't recommend it for the kids). These books would be great for my kids to read. Thanks. I just saw this movie and that book was adorable! I am so excited that it's an actual book now. Thanks for a chance to win! I am now subscribed via email! I love it that a super-villain meets his match with three little orphaned girls. Steve Carell is perfect for this character. I love the prize pack that is being offered. I would love to win it for my grandson. I follow you and subscribe by email. any new books are welcome. it would be great to win this wonderful books! I'd love to win. My son would love this! I read Gone With the Wind after hearing it mentioned on several movies. My kids love this movie and have seen it twice. They thought the Sleepy Little Kittens book was hilarious and I would love to surprise them with it. What a cute tie-in to the movie. I plan on taking my nephew to see it over the weekend. I'm an avid reader so have read many books before they get turned into movies and of course the books are usually better! We do a lot of see a movie, then find a book...or read a book, then see the movie. I know my oldest daughter was really disappointed with the Vampire Diaries books, but loves the series because they haven't changed Elena. It took me a minute to remember the kitties book from the movie - loved it! My kids would love these books! I subscribe via rss in a reader. I took my daycare kids to see the movie and the kitty book is too cute but Gru's book was even better. How adorable! Our family is curious to see Despicable Me; we don't always go for the movies after we've read the book or vice versa, but it's fun when the kids want to explore one way or another! My grandkids want to go see Despicable Me, they like the minions. I'm sure we will take them soon. My daughters favorite movie of the summer what a wonderful contest. I think all the Despicable Me books are fantastic. It seems alot of times books for the younger kids never come out following these great movies. Some of my fave books are Nemo, Toy Story, etc...my little ones enjoy reading and seeing books based on their favorite charaters boosts that. My husband wants to see this movie! 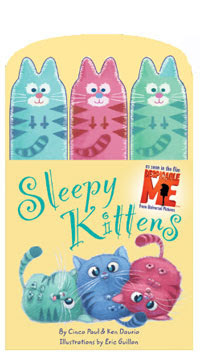 I think the Sleepy Kittens book sounds adorable and is one that I would love to add to my collection. Sleepy Kittens sounds like a great book! My kids would love that you could read the same book (almost) that they did in the movie! I enjoyed this movie! I read Jane Austen after seeing "The Jane Austen Book Club"! I would love to share these books with my preschool class. My two little guys saw the movie and loved it. They also love to read so I'd love to win for them. Thanks for the giveaway! The kids and I read the series, Series of Unfortunate Events after we saw a preview of the movie. I'd love to win this for my kids, since we got tickets to the premiere of Despicable Me and then got turned away at the theater because they had too many people inside! Bummer. This movie was great as was the Sleepy Kittens book in the movie. I hadn't realized it was a real book when seeing the movie. This would be the first book from a movie I'd read. Thanks! If you plan to see the movie and read the book be sure to see the movie first. Then you can visualize the characters and you aren't disappointed if some book scenes are left out. I think it is awesome that this film did this with Sleepy Kittens - what a great tie in. Anything to get kids into reading MORE! My son loved this movie! Thanks for the chance to win! I loved this movie! Very enjoyable, thanks for the chance! We have not seen Despicable Me yet, but we all want to. I like to read the book before seeing the movie because I find it more enjoyable that way. watched wizard of oz and then had to have the book which was excellent&I read it often! I'm hopelessly smitten with the minions, so I'd love to win this!! Many thanks for the giveaway!! I want to see this movie this summer w/ my kiddos. The book My Dad the Super Villain looks like a fun read! I am laughing cause that book Sleepy Kittens is in this package, it is so cute! When we saw the movie I didn't know it was a real book but I guess it is lol! I want it! I gotta say after I saw E.T. I begged my Mom to buy me some Reeses's Pieces. I loved this movie! Sooooo cute! I have never read a book after it was in a movie. I saw this movie and did not relize that Sleepy Kittens was a real book. It was very cute in the movie. My kids want to see the movie.